A blue bobble hat went into circulation – and ultimately landed in the judging session of the Promotional Gift Award 2017. The hat is part of the “For those who truly love” campaign of the health insurance company, Zurich Versicherung. As a key visual it is used among others to cover a car to provide it with optimal protection. 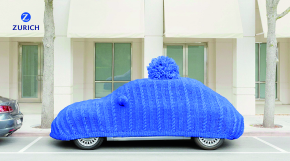 To add a haptic lining to the care campaign, Brand Addition produced the bobble hat in various forms, i.e. as a golf club sleeve, as part of a snowman set, to cover a stone in the customer’s foyer or to protect the trophy during the final of the Swiss Key Ice Hockey Cup. And of course, as a classic, knitted bobble hat with a logo for the customers of Zurich Versicherung. Thus, the product achieves the set communication goal and attracts plenty of positive response as an advertising messenger, was the verdict of the jury members, who promptly conferred the item with an award in the category Best Practice.